I guess I have always had a love for bears. 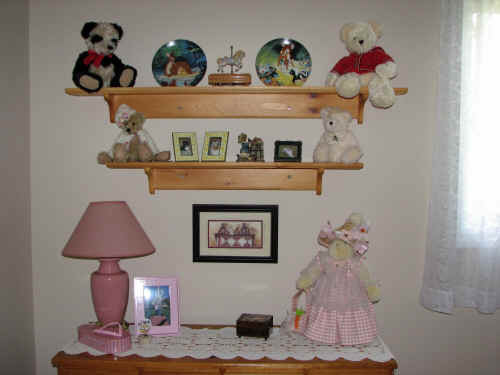 My mother tells me that even as a small child, I would not go to sleep until all my teddy bears were safely lined up around the crib. 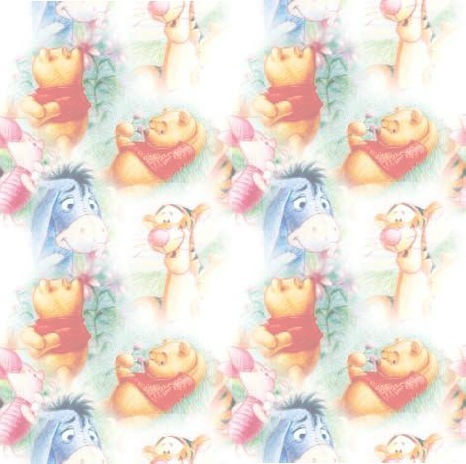 If even one were missing my parents would have to search frantically until it was located. 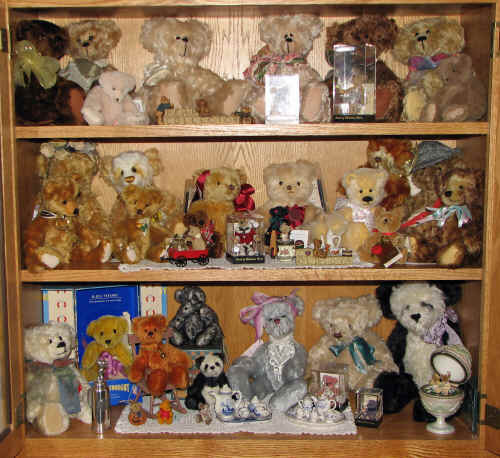 I started collecting teddy bears many years ago, it was really quite unplanned. 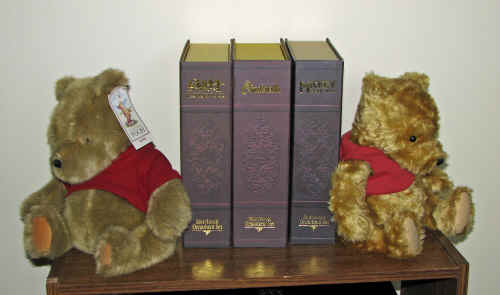 Dickens was a bear that my then teenage son had bought for his girl friend in 1986. When they broke up she returned the bear, he didn’t want it so I said I’d take it. 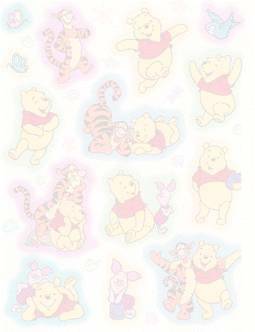 My mother and I had gone to Walt Disney World and every time we walked through the shops there was a Winnie the Pooh bear that I kept picking up and hugging. It was incredibly soft and just needed to be squeezed. 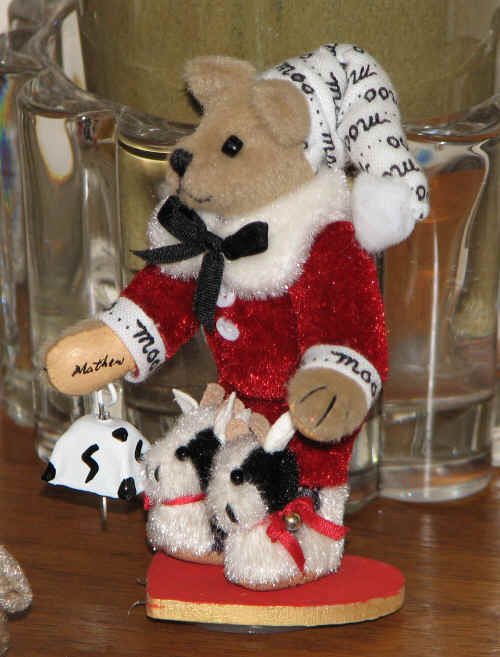 She had wanted to buy me a keepsake gift as a reminder of the trip so the bear became that gift. That was back in August 1990. 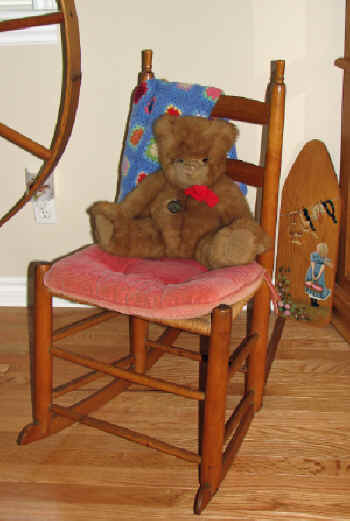 The Pooh bear came home with me and shared a spot in a rocking chair with the Gund bear named Dickens. So now I had two bears and the start of a collection. 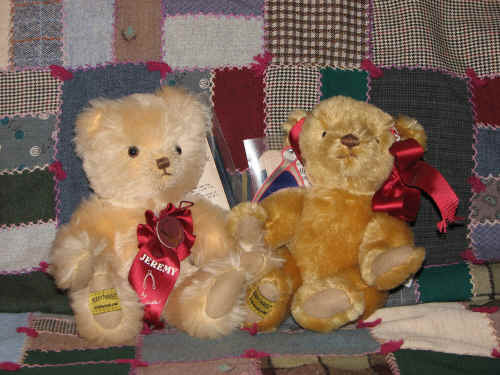 Some time between then and 1993, I believe I had purchased several bears that caught my eye but the serious collecting didn’t start until, by chance, we were at Walt Disney World in November 1993 during the annual Doll and Teddy Bear Convention. 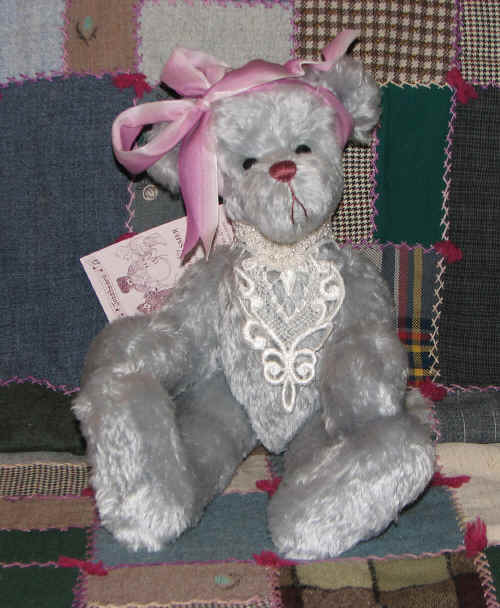 That’s when I learned about one of a kind bear’s, limited edition bears, hand made bears and of course mohair bears. I was hooked! 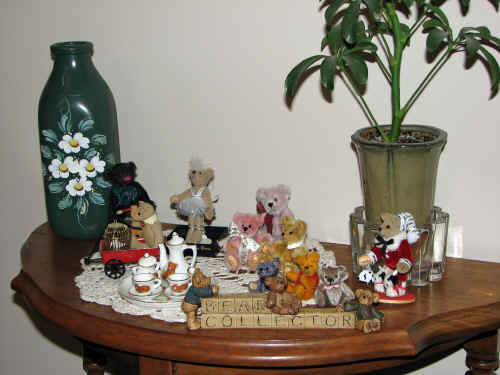 The collection grew, as my pocket book would allow, with what I call my “collectable bears”. 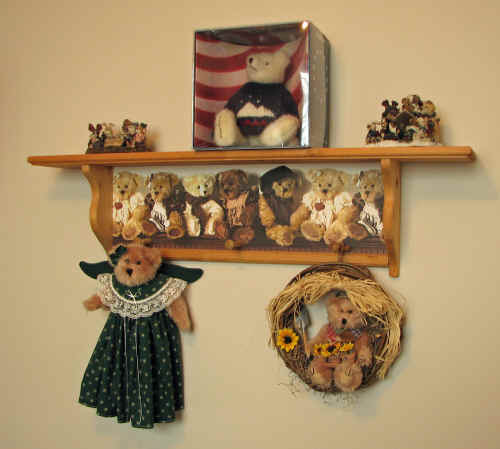 It also grew in leaps and bounds with "off the shelf" bears that were cute, cuddly or just looking like they need a home. 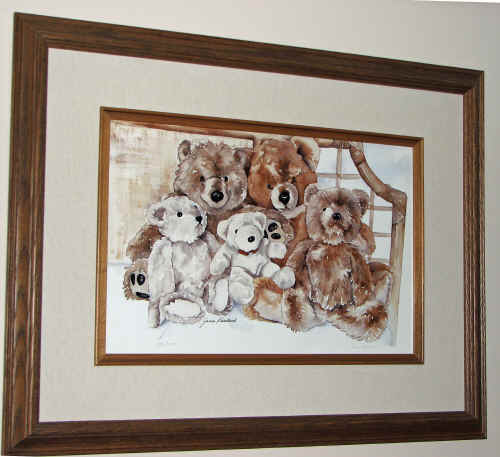 My friends and family started purchasing bears as gifts and soon the house was over-run with furry creatures. 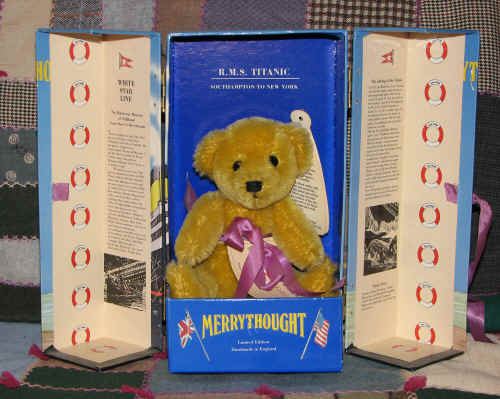 My son and parents knew all about my love for the "collectable bear" so my collection grew every birthday and Christmas. By the time I moved to Burlington to be with Gary the number of bears was probably close to 300. They were everywhere in the house. It was time to part with some of my friends but since I had an attachment to them, it wasn’t an easy feat. My “collectables” were nicely housed in a cabinet that Gary had built for me; they were protected from the elements and kept quite pristine. The others required regular vacuuming and dusting. I knew I had to cull my collection. As I started the cull I vacuumed each one and decided if it was a keeper or if it had to go. 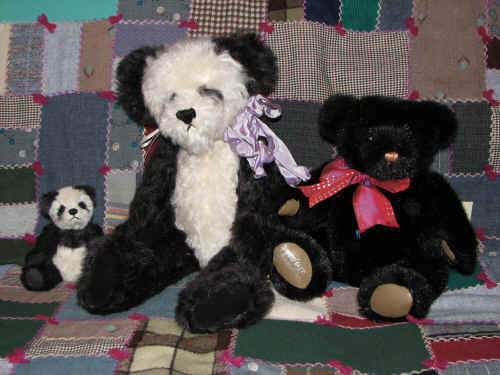 I ended up with about 100 bears ready to be shipped to a mission in Northern Canada. 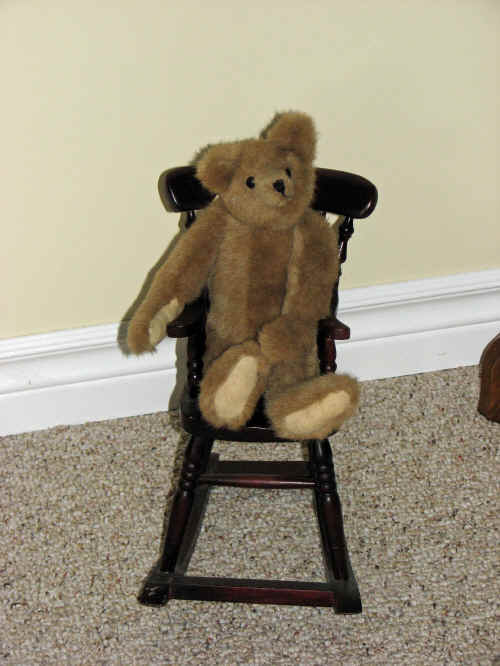 The following year another cull was made and about 70 bears went to the Emergency Assistance Team in Ontario, the bears traveled with police and firemen and were given to children. 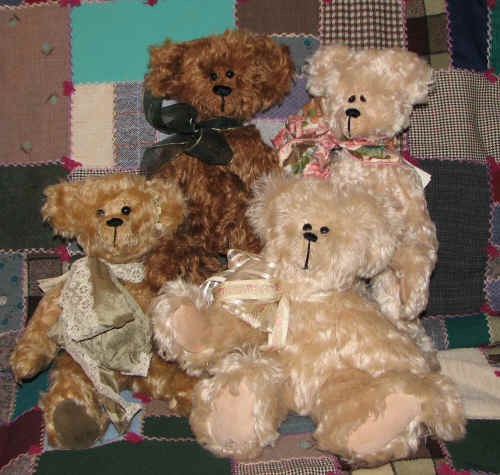 Over the years that I have culled my collection I have donated hundreds of bears to charities that deal with children in distress, and to other worthy causes. 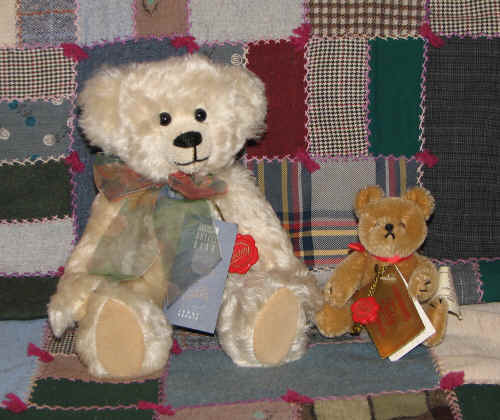 No bear should go unloved, so I am happy to give them to someone who will love them. 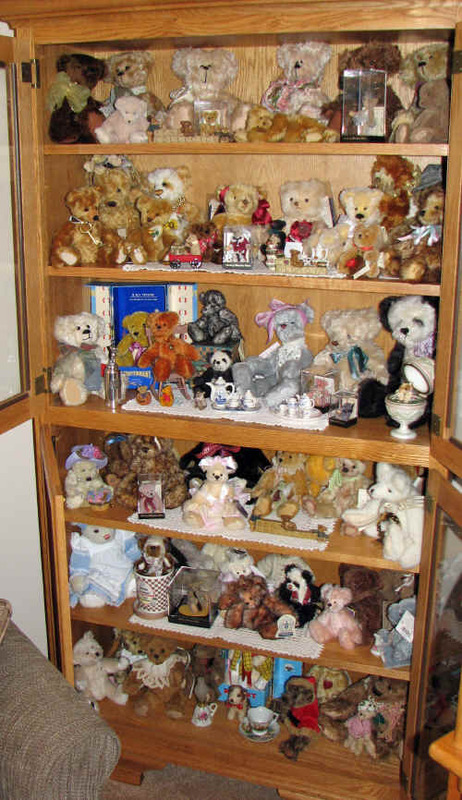 In my den, where I spend a lot of time at my computer, I have a large oak cabinet where I keep my most precious pals, my "collectable bears". 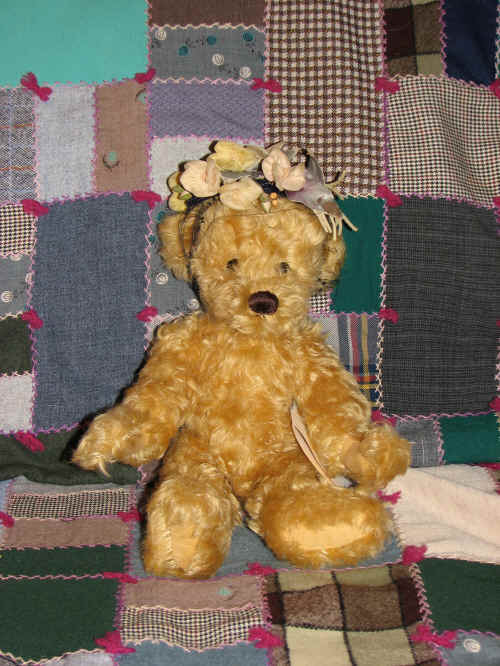 They are all limited editions or one of a kind bears, hand made by some of my favourite bear artists. 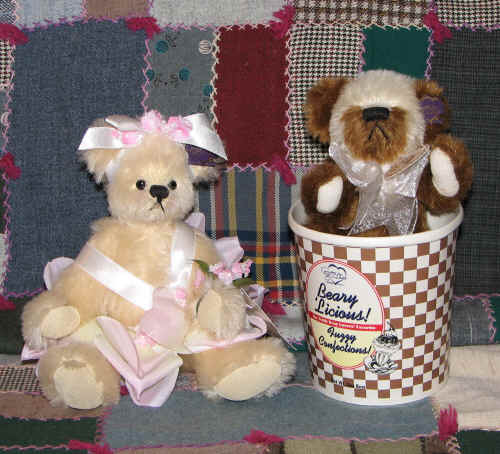 There are also some manufactured bears such as: Boyd's Bears, Merrythought, Gund, Hermann, Stief, Canterbury and Mary Meyers. 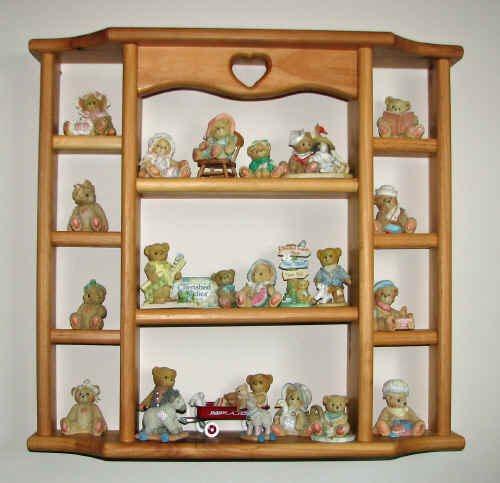 I also have a few Cherished Teddies, they are so cute and hard to resist. My collection is unique since I got most of them at Disney when the creator, Pricilla Hillman was there signing them. He's 2 3/4 inches tall . . . 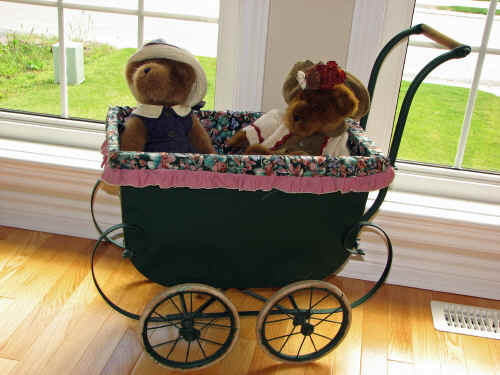 So if you look around the house these days you will not see quite so many bears, but you would be hard pressed to go into a room that doesn’t have at least a couple of bears tucked in some where. 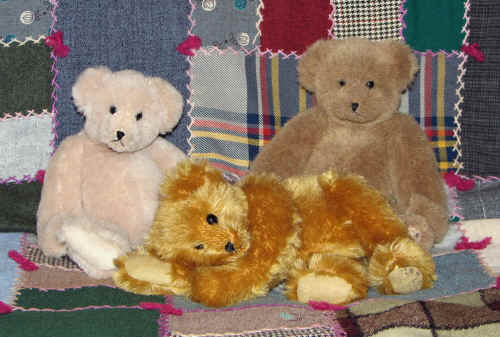 My collection has grown to the point where I am now quite fussy about my bears. I only add very special ones to my collection . 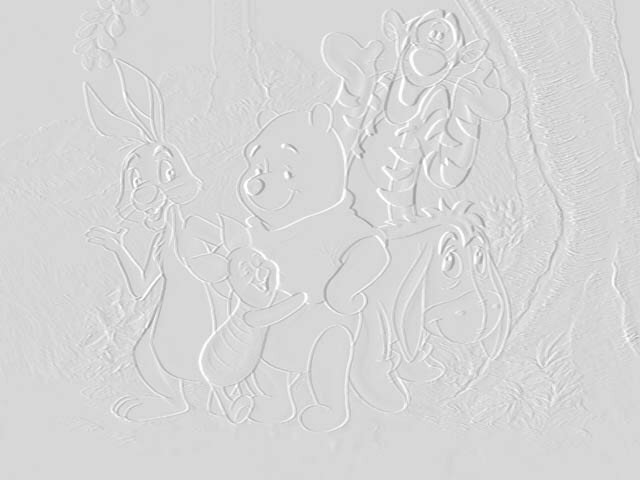 . . bears that speak to me and say, "Take me home!"